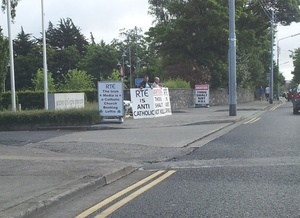 Outside RTE, Nutley Lane, Donnybrook,, this morning. They want to see more priests in ‘front of camera’ and an extra 15 seconds on the Angelus. Posted in Misc and tagged Pro-Life, RTE at 9:25 am on July 4, 2013 by Broadsheet.